Control of the ball with your chips will put you in position to have short putts on the green. Learning to master your wedges is a great way to cut valuable strokes off your score. Hitting a chip shot, and using back spin to stop the ball on a dime, or even cause the ball to spin back toward you, opens up access to even the most tightly placed hole position. All golf clubs used on the ball will put spin on the ball, which affects the flight of the ball, as well as the way the ball reacts when it hits the ground. The clubs, which are most capable of applying spin, are the wedges in a bag, which feature shallow club faces and chip the ball very high, relative to the distance the ball travels. Spin is put on the ball by the grooves on the golf club's face, which catch on the ball as it comes off the face of the club, spinning it backwards as it leaves the face. The more grooves on the face of a club, the more spin it will apply, and the shallower the slope of the ball at the moment of impact, the more of an effect the grooves will have, creating more spin. When attempting to hit a shot to a pin, which is located without a lot of green around it, be it because there is a bunker in front of it or simply rough, which can be unreliable to bounce a ball through, a shot with a lot of spin is desired. 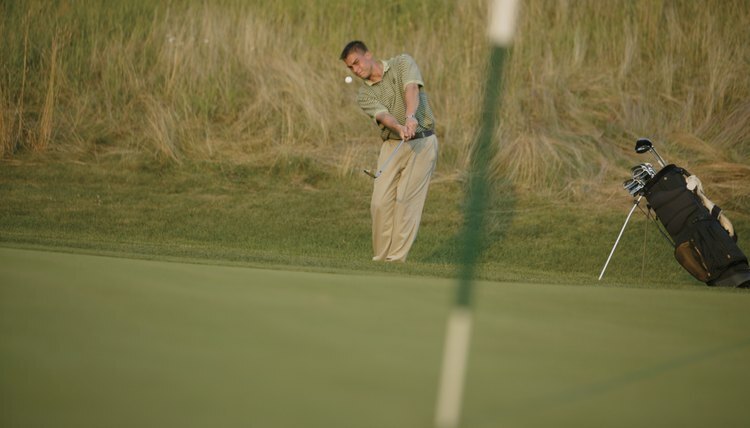 With more spin on the ball, the player can stop the ball where it lands, or aim past the hole, and allow the ball to back up toward it when it lands. To add spin to a shot, the shaft is rotated in the players hands so that the club is more open, meaning the face is shallower. The lead foot, hip and shoulders are moved slightly back from the ball in relation to a regular stance, allowing the club to slice under the ball at an angle, creating a higher shot than normal with extra back spin. When a player is presented with a shot with a lot of green between them and the hole, many players prefer to hit their wedge with less spin to hit a low shot, which skids along the ground toward the hole. To lower the trajectory of the ball, and put less back spin on it, the player closes the face of the club, or makes it steeper. This is performed by setting up with the ball farther back in the player's stance. With the ball farther back, the club becomes naturally angled so that the face is steeper. This forces the ball off much closer to the ground, and provides the grooves with less opportunity to put spin on the ball, allowing it to roll farther.